No, not that kind of Divinium. Thanks to @Hells Warrrior getting the system up and running, CoDz now has a form of "currency" called Divinium ! This currency is all forum-based and uses post/topic content and contest winnings as a monetary base. 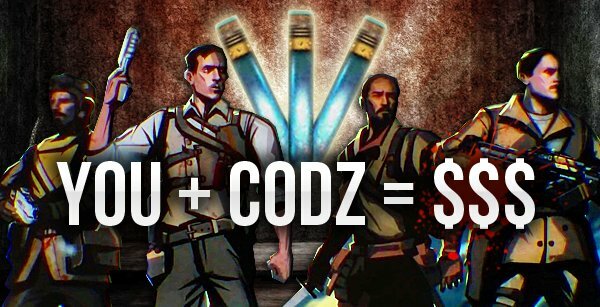 Divinium on the forum can be used for the CoDz store - a new and upcoming mod we have coming up soon where users can buy REAL products such as Xbox/Playstation/Steam cards, Zombies merchandise, special user ranks that can't be obtained anywhere else, and more! Divinium is a basic points system; you get +1 Divinium for each post and topic that's created. When we hold special contests (such as the Ancient Trials challenges coming soon), you can win anywhere from +5 to +100 Divinium. Donors will manually be given +100 Divinium for having donated before 6/3/16 [please PM me so I can adjust your Divinium for you]. You can use our Store to purchase items, depending on the amount of Divinium you have. Please bear in mind that everyone starts out at zero regardless how many current posts/topics you have created. As part of our grand opening, all new members who register after the making of this thread will automatically receive +100 Divinium as our way of saying thanks! Because Divinium works on a user-activity structure, it's designed to reward you for engaging with the community! There are many ways to gain Divinium outside of posting; however, the easiest way to begin farming Divinium is to actively take part in our discussions and events! When special events are held, the Divine Controllers will feel sympathy for slayers in all universe by offering power-ups to increase your rate of Dvinium ten-fold! Look out for these power-ups in the upcoming future. Fire Sale: Take a chance and get your rewards cheaper while the sales last! If you are a Donor, you net additional Divinium for each donation that you make to help fund rewards, server costs, and maintenance of the forum. All donations are highly appreciated - all revenue goes to keeping CoDz up! You can gain additional Divinium the larger the donation! The higher you rise in "donation class", the more extra DV you'll obtain. For every new class you enter, you retain the previous class perk value at the base. For example, donating $50 come out to 100(0.05(50)) + 17 (50/15) = 307. The algorithms for understanding how each class works is as follows. - If a person donates between $10-$29, they get 10x Divinium for every $10 spent. - If a person donates between $30-$50, they get 17x Divinium for every $15 spent. - If a person donates $50+, they get 25x Divinium for every $20 spent. The amount donated is after the donation has been process including the PayPal fee. For example, donating $10 comes out to roughly $9.41 after fees, which will be the amount donated value to be included in the Divinium calculation. What can I get from Divinium? Visit our Divinium Factory to start splurging all your hard-earned Divnium for a lovely gift! You can find the rewards catalog by click More > CoDz Shop in the top menu. By using our Divinium system and being an active member, you are agreeing to the following rules. Spamming posts whether creating poor-quality content or rapidly submitting posts in a quick time-span is considered Divinium pumping, and is strictly prohibited. Users cannot "exchange" Divinium to one another, in the form of providing Divinium to one another for trade-off purposes, This is considered abuse and is not allowed. Creating secondary accounts used to Divinium pump is prohibited. Any form of abuse with the purpose of maliciously gaining Divinium unnaturally is prohibited. Taking advantage of the system in these ways and others not specified will result in anywhere from a suspension or IP ban. We advise that you use the Divinium system respectfully - this is a privilege to give back to the community! The CODZ Team strikes again. This is a great idea. Excited to see how this evolves and where it takes us! That's a pretty cool addition to the forum. Hopefully this encourages more dormant users to start participating in discussions again. Hopefully it leads to more quality posts. Heck even I want to start doing more posts now haha. This is amazing, One of the best ideas I've seen on a forum. Money? BAH! with my posting I should be a millionaire! Seems like a really good idea. For whatever reason, it is very quiet here at the moment, anything that is going to encourage people to post/ join/ contribute is a positive step. This is great. So well laid out, I look forward to seeing rewards going out to all the great CoDZers who make this forum the legend that it is. And I will reiterate as was said in the OP, all financial contributions go to the forum herself and keeping it running for, hopefully, years to come. This is not what my addiction to this site needs. you're fueling my addiction CoDZ! Yes; you'll be given 100 DV for being a past donor. I got you covered fam. In light of how popular our store has been (with praise from both this community and the Twitter-verse), we'll allowing you a little sneak peak of a design or two coming soon. It could be on clothing apparel, an object you use every day, who knows! Let us know what you think and what rewards you'd like to see from our Divinium Factory. So does the rank/colored username go away after 3 months? Nope!! It says for as you want. The Divinium Factory's official store has gotten a remodel, including a more organized system! Now, you can have a separate Store account to save your orders and billing/shipping information! This factory, unlike the one within the forum, is our CoDz Store. You can buy custom gear made by CoDz, with all proceeds going to keeping the forum up as well as providing new goodies such as future products, plugins, and tournament prizes. It's wunderwa! The in-forum DF will also contain new products coming in the new year for those who stashed a little extra Divinium during the holidays! Looks neat! And I finally found where @Spider had his "timetraveller" rank from. Still need 37 D$ to purchase something. And that "double points power up" you can buy, does that count for the upcoming Ancient Trials? Yes, you can! It can be used on any tournament/challenge. For the Ancient Trials, you can use it once (unless you buy more). Obviously worth it if you see yourself high in the brackets haha! @InfestLithium Have we got badges for them fancy ranks? @Spider I definitely will make some unique ones once I have the chance! Alongside new master ranks, of course. We are rolling out with a New Years update that will be a blast!